Dig deep enough into the conspiracy theory threads on sites like Reddit and it won't take long to find at least a couple rumors or even "proof" that aliens are out there, observing us here on Earth. Of course, most of those theories are peddled by wing nuts or amateurs with zero evidence to support their arguments. But now, Harvard scientists are raising the possibility that a large, mysterious object that recently passed through our solar system may have been an alien spacecraft. 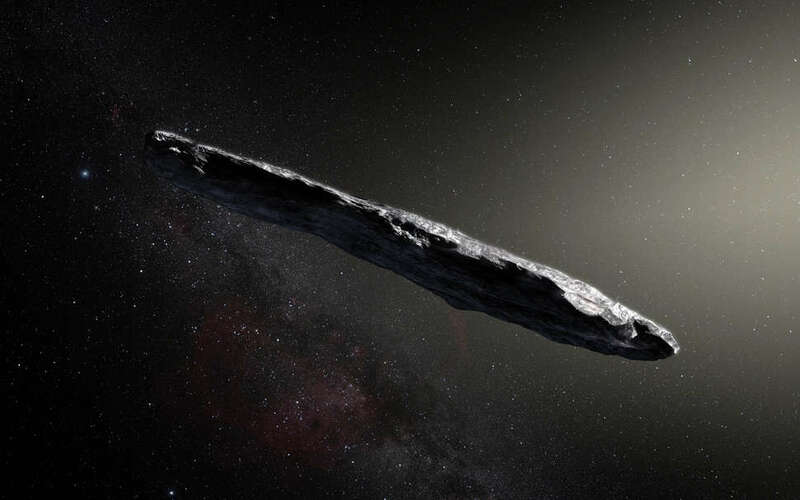 In a new study, a pair of researchers at Harvard raise the prospect that Oumuamua, the large cigar-shaped object that was spotted cruising past the sun at an incredibly high speed and odd trajectory late last year, was a probe sent by an alien civilization to scope out Earth. Their hypothesis, which will be published in The Astrophysical Journal Letters on November 12, isn't that it was definitely sent from extraterrestrials, but rather suggests that it very well could have been based on the way it accelerated and traveled through space. Not to get too technical about it all, but the study essentially suggests that based on its unique acceleration, Oumuamua could be "a new class of thin interstellar material" that uses light to move. Specifically, it says it could be a "solar light sail' designed to whip through space via solar wind and that it may even "be a fully operational probe sent intentionally to Earth vicinity by an alien civilization." Now, before you start spreading the word that aliens are out there spying on us, it's important to consider that this research paper is by no means a confirmation that they are. In fact, even the authors of the study insist more research and intel is needed to come to any definitive conclusions. "It is impossible to guess the purpose behind Oumuamua without more data," study co-author Avi Loeb and chairman or Harvard's astronomy department told NBC News. News of the paper's publication has also been met with resistance from others in the scientific community, who claim that even running with the notion that it might be an alien spacecraft is vaguely dishonest. "In science, we must ask ourselves, 'Where is the evidence?,' not 'Where is the lack of evidence so that I can fit in any hypothesis that I like?'" said Coryn Bailer-Jones, an astronomer at the Max Planck Institute for Astronomy, per the report. "If it were a spacecraft, this tumbling would make it impossible to keep any instruments pointed at the Earth. Of course, one could now say it was an accident, or the aliens did this to deceive us. One can always come up with increasingly implausible suggestions that have no evidence in order to maintain an idea." Yet another expert in the field, Ohio State astrophysicist Paul Sutter, took to Twitter to sound off on how unlikely it is that Oumuamua was sent by aliens. Unfortunately, it'll be tough to investigate the matter much further since Oumuamua is long gone from the solar system and not even visible with a telescope. Though even if it's not some probe sent by sentient beings from far, far away, there's still reason to suspect some intergalactic interlopers may be lurking in our midst.